on your bottom line... Yikes! First: AirTech simply thinks it is wrong to charge the same price for a sensor whether it has a rubber or metal valve. Rubber valves are less expensive. To us, this is just common sense. You literally have to double (or up to 5x) your inventory just because a different cheap valve is attached to an expensive sensor. Add to that, the cost of lost sales when you are out of the combination you need. Your supplier loves that you are forced to overstock expensive sensors. AirTech prefers that you invest less in sensors and make more money with no lost sales. If you sell Cub programmable, you started with a 2 sensor solution, today you have a 5 sensor solution. That is a huge difference in inventory investment compared to our true 2 sensor solution. AirTech suggests cutting your inventory investment in half, order what you need, stock a few more valves, and never loose a sale. At the same time as you save on inventory, make more profit by Increasing your inventory turns 200%. This is how a smart shop or distributor works today to increase profit. Think about it, valveless sensors make you more money. The math is simple. The quality of our valves is unmatched in the aftermarket. Our factory is one of the top 3 valve factories in the world, supplying OE valves to car makers with the highest QC standards. This Rubber Snap Valve is made to the highest OE standards from one of the worlds top valve factories. It is made to fit AirTech AT2315a and AT2433a sensors. It will not fit other manufacturer's TPMS sensors. What’s unique about AirTech, is that we sell our sensors valveless. This is a huge advantage for our customers. Why stock so many expensive sensors when the only difference is a inexpensive valve. No more lost sales from not having the perfect valve in stock. Sold As A 4pc Set. 4 Valves to Box. 3 Boxes to Inner Pack. Finish: Black Rubber with TPMS gap under plastic cap. 1.4Nm Used on screw/nut that attaches valves to sensors. This Silver Metal Valve is made to the highest OE standards from one of the worlds top valve factories. It is made to fit AirTech AT2315a and AT2433a sensors. It will not fit other manufacturer's TPMS sensors. 4.0Nm Used on nut that attaches valves to wheel. This Black Metal Valve is made to the highest OE standards from one of the worlds top valve factories. It is made to fit AirTech AT2315a and AT2433a sensors. It will not fit other manufacturer's TPMS sensors. This Polished Metal Valve is made to the highest OE standards from one of the worlds top valve factories. It is made to fit AirTech AT2315a and AT2433a sensors. It will not fit other manufacturer's TPMS sensors. If you only order valves, in the same usage quantities matched to sensors as you have in the past, you are missing the true opportunity valveless sensors offer. On pure economics of our line, your TPMS inventory investment should be around 25% of your current investment. Half saved by not having to stock valve attached sensors, and half again if you buy into more frequent purchases which double your inventory turns to increase your profits even more. Take a very very small portion of those savings, and overstock a little on inexpensive valves. Your customers will enjoy the new stocked options, and you will maximize your sales with NO LOST SALES. 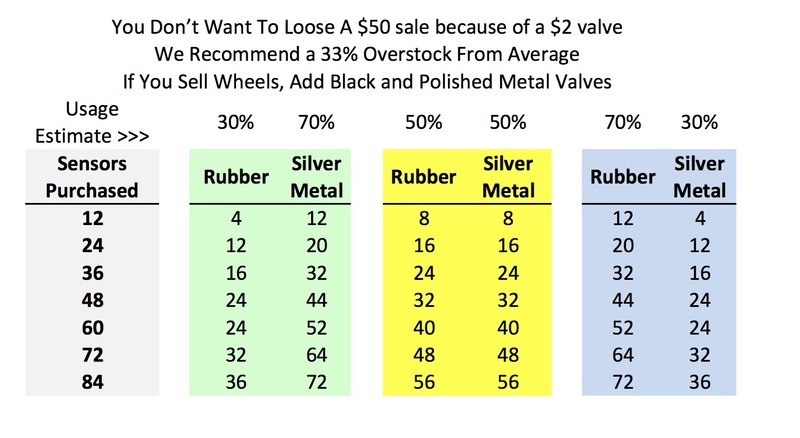 Use this chart, identify the overall Rubber to Metal historical average use and give the chart a chance. You can always modify it down the road to your exact needs.